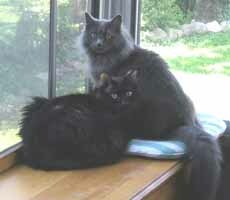 We brought Susannah home in November 2006 to join MacDuff and Ziggy. I met her at the Pampered Feline, where Ziggy had been living prior to his adoption in Feb 2006. The staff assured me that she was a sweet, but very shy girl, always too nervous to come out of her cage if anyone was watching. She was hiding in her bed, so I just slipped one finger over the edge, but didn't look at her. She cautiously rubbed her face on my finger, and broke into a huge purr. I hadn't been intending to get a third cat, but she stole my heart in that moment. Knowing that she needed a very quiet environment and lots of patience, we brought her home to meet Duffy and Ziggy. Introductions were uneventful, and they all get along really well. She's taken a great liking to Duffy just as Ziggy did, so now he has a devoted fan club. It's been a year now, and she's made wonderful progress, but very slowly. At first, if you just looked at her, she was on edge. Walking towards her while looking at her, sent her scurrying for cover. But as her curiousity overcomes her fear, and she watches Duff and Zig, she makes baby steps forward. It was 6 months before she honoured me with our first forehead-to-forehead bump. She is still not sure about having her tummy or her feet touched, but we're slowly working on that too. Ziggy is a former barn cat, who is thoroughly enjoying his new life of comfort. He is the cuddliest cat we've ever known. When I sit on the floor, he crawls into my lap right away. With him in my lap, now Susannah comes over for her share of attention too. She loves to have her ruff scratched and to be brushed, thank goodness for that, as she has an enormous amount of fur. Her favourite bed is anything made of wool, whether it's blankets or sweaters. 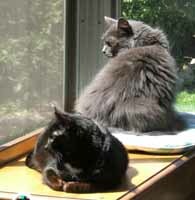 They all enjoy sitting in our enclosed porch in good weather, soaking up the sun, and watching the birds at the feeder. Here are some photos of her with her new family.